An engraving of Charles II as king: bust length, with a curled wig, lace tie, Garter Collar with George, and armour. Within an oval border bearing a Latin inscription, and with engraved monograms at each corner. With the publisher's address inscribed below, 'Sould by P. Vandrebanc at ye White beare in Kings Street Covent garde and Iohn Overton at ye White horse without Newgate'. Borders trimmed. A fine impression and extremely rare. 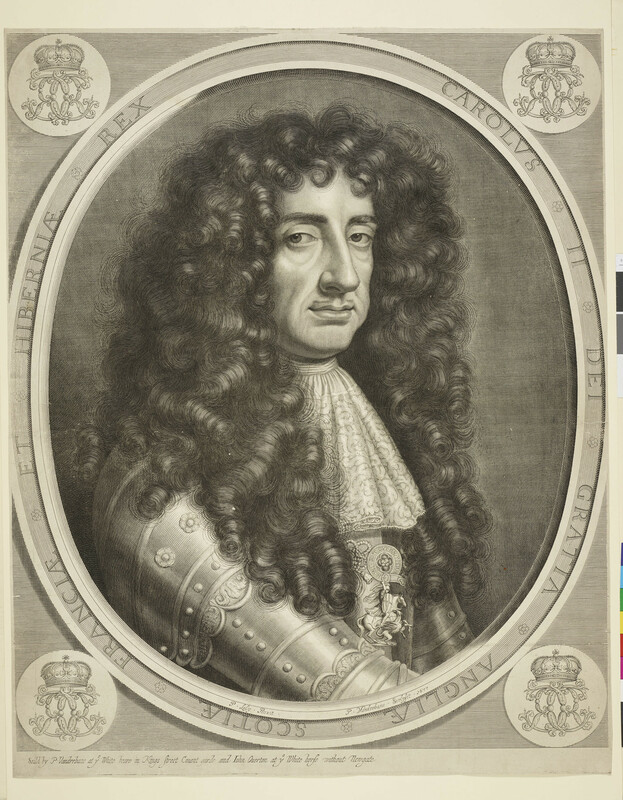 This print was the second large portrait of Charles II engraved by Vandrebanc; in 1675 he produced a life-sized engraving after a portrait by Henri Gascar (see RCIN 602612). This engraving after Sir Peter Lely is incredibly close to another contemporary print of the King by Abraham Blooteling (see RCIN 602538). Both prints are exactly identical in size and facial features, and both correspond exactly to a drawing also in the Royal Collection, see RCIN 912839. As the Blooteling mezzotint is not dated, it is hard to determine with certainty which portrait came first, and to which the drawing relates.